The fourth time was the charm for Osage wrestler Hunter Robinson. Currently ranked 4th in the Nation, the 148 lb. 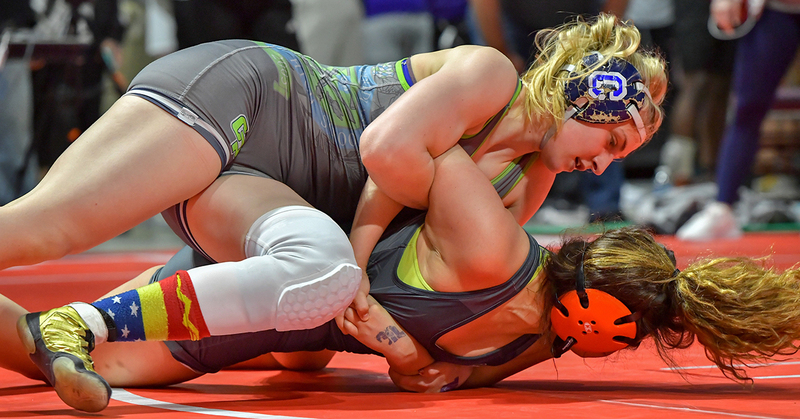 wrestler from Woodlands, Texas, won gold in the Class 6A State Championships for College Park High School and ended her senior year unbeaten, with a perfect 44-0 record. But her career is far from over. She will next compete at the National Championships in freestyle wrestling in Fargo, North Dakota in July. She also has to select one of 12 colleges who have been courting her for the past few years. Osage News: How does it feel to end your high school career as the state champion? What all was given to you? Where do you keep your trophy? News: What does your current training consist of since you’re continuing to compete in Nationals? News: Do you aspire to compete in the Olympics? What would that entail? News: What colleges are you considering? What type of degree would you like to pursue? News: Where would you like to see yourself in five years? Hunter Robinson is the daughter of Owen and Heather Robinson (Osage) and sister to Chance, Evan and Jackson. She is the granddaughter of Caleb Long (Osage) and Carol Jarrell and great-great-granddaughter of Hallie Reece Adams. She is a descendant of Chief MoyToy.